This is probably yet another self sown weed rhododendron plant, there seem to be quite a few which are rearing up into proper plants now the thick pall of Leylandii Cypress have been removed. Did I say we have removed about 60 of the suburbia eating monsters? It has taken four years but we have done it bit by bit and after seeing how high the pile of loped branches could go (fifteen foot by ten foot by seven foot high) we have tried to deal with each small group of trees fully before cutting down more. We have shredded and burnt almost everything. The wood makes adequate fuel if it is well dried. The mulch from the shredded pile mixed with the wood ash from the fire will help the flower beds. The change in terms of light levels and a sense of space and freedom has been incredible. It also seems incredible that that many extra trees were squeezed into the garden. They were planted so close that some were standing dead and could be pushed over by hand onto the neighbouring tree. 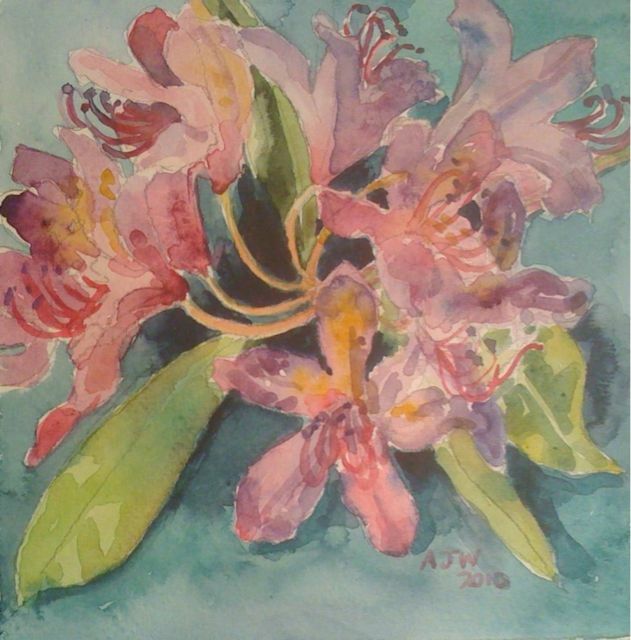 The thing about rhododendrons is, you either love them or you hate them. I was entranced by them as a child; they have such a definite bold presence. The colours are straight out of a paint box too; well you think they are until you try and paint them. I am not so fond of them now, but I prefer the slightly scrawny flowers of these purple ones to the blobby Barbie pink ones that were clearly prize purchases of the previous gardener here. I deliberately painted this fast as I did not want to get bogged down with the spotty detail and the pretty stamens. It would need a carefully planned slow painting to get those right, they need to be kept in their place if they are to be shown exactly otherwise all you see is the detail-losing the overall shape and shading. Of course some of the rhododendrons will have to go the same way as the Leylandii as they too can overpower a garden pretty fast. There is other news; the robin learnt from his last mistake and built his new nest six feet off the ground in a conifer…but a young squirrel found it and sent all the songbirds into full alarm. The eggs had not even hatched this time, one day he will find the RSPB spec. bird box (robin design) and actually use it.